Teresa Bandettini was one of the most famous improvisatrici from early 19th century Italy. The italians had an equivalent of the poetry slam, in which members of the audience proposed themes, and the improvisatrici composed extemporaneous verse on the theme. She was born in Lucca, in 1763, to a fairly poor family, and chose dancing as her way out of poverty. Her mother taught her to read, but when she realised that she was always distracted from her dancing lessons by reading and writing poetry, banned her from reading or writing for pleasure. Regardless, she kept writing poetry secretly at night, with pen and paper smuggled in from a friend at dancing school, and educated herself by reading the great italian poets, with the help of a friendly monk. She debuted as a dancer at the age of sixteen, and was successful enough to dance in Florence, Bologna and Venice. She kept reading, and added Latin translation, by translating Ovid, and worked her way through the Divine Comedy of Dante. At this point, she started improvising poetry in public, and became known as the ballerina literate. She increasingly became well known enough to be able to spend time with more well known poets and intellectuals of the era. At the age of 26, she married Pietro Landucci, a fellow Lucca native. He encouraged her to give up her dancing, and spend all her time her improvisation. She did so, and became known as the Improvvisatrice Commossa – the moving improvisor. 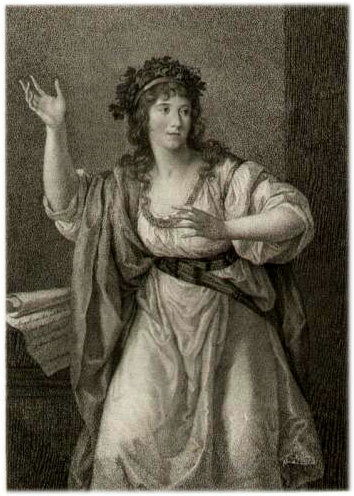 She travelled all over Italy giving performances, including one very famous series of performances in Rome, where she composed eight times on the same theme, each time with a different metre. Many poets and artists dedicated works to her, including poems and paintings dedicated to immortalising her improvising. Paganini dedicated six sonatas to her, which were only discovered recently. She performed before Napoleon, and joined the court of the Bourbons at the Grand Duchy of Lucca in 1819, where she was granted an annuity, because they were so taken with her poetry. She also wrote and published poetry, but tried to keep her improvisations from being published, even though her many fans (including the Grand Duke of Lucca) would have liked them to be, preferring to polish her public work. She published many volumes of poetry, even so, so her total output was prodigious. She had four children, three girls who died young, (one the subject of several very moving poems on the Death of a Daughter) and a son, and died aged 74, in Lucca, in 1837. This is part of a serious of notable women from where we are as we travel the world. I’d love suggestions for future subjects – our itinerary is here.